Please join the Chicana Latina Foundation for this special event featuring a conversation between activist, author and educator Angela Davis and community leader Olga Talamante. Moderated by KPOO’s Chelis López, the event will also feature a musical set by the Oakland-based repertory group Young Gifted and Black! Directly following the conversation, join CLF along with Angela Davis, Olga Talamante, Chelis López and the Maestrapeace muralists for a ticketed reception in Brava’s Cabaret. All proceeds from Voices of the Resistance go to support the scholarship and leadership programs of the Chicana Latina Foundation, as well as the Maestrapeace muralists upcoming book, MAESTRAPEACE: Murals of The San Francisco Women's Building, which opens with an essay by Angela Davis. 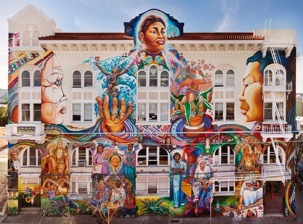 MAESTRAPEACE, Lapidge Street façade, The San Francisco Women's Building, 18th and Valencia Streets, Juana Alicia, Edythe Boone, Miranda Bergman, Susan Cervantes, Meera Desai, Yvonne Littleton and Irene Perez, © 1994, 2000, 2010. MAESTRAPEACE stands five stories tall, vibrantly illuminating the walls of the San Francisco Women's Building, inside and out. These murals are a jewel of the Mission District, a historic treasure on a National Heritage Building, and a magnet for thousands of visitors. The murals are beloved by the surrounding community, and across the globe. It is now time to create a book devoted solely to MAESTRAPEACE. This moderately priced, widely accessible and photographically sumptuous book will preserve our legacy. In partnership with Heyday Books, San Francisco Heritage, and with your help, we can do it! MAESTRAPEACE muralists include Juana Alicia, Miranda Bergman, Edythe Boone, Susan Kelk Cervantes, Meera Desai, Yvonne Littleton and Irene Perez. Professor Angela Davis is the author of nine books and has lectured worldwide. Recently, a persistent theme of her work has been the range of social problems associated with incarceration and the generalized criminalization of those communities that are most affected by poverty and racial discrimination. She draws upon her own experiences in the early seventies as a person who spent eighteen months in jail and on trial, after being placed on the FBI’s “Ten Most Wanted List” for a crime she did not commit. She has also conducted extensive research on numerous issues related to race, gender and imprisonment. Davis’ most recent books are Abolition Democracy, Are Prisons Obsolete and The Meaning of Freedom. She is a member of the executive board of the Women of Color Resource Center, a San Francisco Bay Area organization that emphasizes popular education—of and about women who live in conditions of poverty. She also works with Critical Resistance, a national organization dedicated to the dismantling of the prison industrial complex. Internationally, she is affiliated with Sisters Inside, an abolitionist organization based in Queensland, Australia that works in solidarity with women in prison. Professor Davis’ teaching career has taken her to San Francisco State University, Mills College, and UC Berkeley. She also has taught at UCLA, Vassar, the Claremont Colleges, and Stanford University. She spent the last fifteen years at the University of California Santa Cruz where she is now Distinguished Professor Emerita of History of Consciousness, an interdisciplinary Ph.D program, and of Feminist Studies. Olga Talamante became the first Executive Director of the Chicana Latina Foundation in January 2003, a position from which she retired in March of 2018. She is widely respected for her community activism and leadership. During the mid-seventies, she became well known for her experience as a political prisoner in Argentina. As a result of a successful grass-roots campaign, she was released after spending 16 months in an Argentine prison. Since her return to the United States, she has remained active in the Chicano, Latin American solidarity, LGBTQ and progressive political movements. Five years ago she was honored to be a Community Grand Marshall for the San Francisco LGBTQ Pride Parade. Currently she serves on the Boards of El Concilio of San Mateo County; the Horizons Foundation, the National Center for Lesbian Rights and the Greenlining Institute. She recently received an Honorary Doctorate Degree from the School of Education at the University of San Francisco and the Cesar Chavez Legacy Award in March of 2017. Chelis López is an award-winning Mexican journalist who has lived in San Francisco since 1996. For eight years she hosted the national radio show Línea Abierta at Radio Bilingüe, the National Latino Public Radio Network where she interviewed and produced diverse stories including live broadcast of The Smithsonian Folklife Festival, an annual celebration of communities and cultures in the United States and around the world presented annually in Washington, D.C..
She is the host and producer of two Spanish-language shows on KPOO 89.5FM in San Francisco "Pájaro Latinoamericano" and "Andanzas" where she explores and offer news, comments and interviews with newsmakers and artists throughout Latin America. She is also the San Francisco correspondent for Rompeviento TV in Mexico as well as hosting locally at Marin TV. In 1998 she started a monthly Spanish-language reading group "Rincón Literario", held at the San Francisco Main Library. As a cultural worker and activist, Chelis organizes book presentations, writer tributes and musical presentations. She has interviewed such greats as Eduardo Galeano; Guadalupe Rivera Marin, daughter of Diego Rivera; Concha Buika, Elena Poniatowska, Dolores Huerta, Gioconda Belli, Toto la Momposina, Carlos Fuentes, Francisco Toledo, Fernando Botero among others. Chelis is also a frequent host at Yerba Buena Gardens Festival and at The de Young Museum. In 2015 she won the Latino Heritage Media Award, and in 2013 she was awarded the prestigious Jose Martí Publishing Award by The National Association of Hispanic Publications. Young Gifted and Black (YGB) is a youth cultural arts and education repertory group sponsored by 100 Black Men of The Bay Area, The African American Male Achievement Initiative and Youth Speaks Inc.
YGB was reinitiated in Oakland California in partnership with the Oakland Oratorical Festival and OUSD in 2009. The group has performed on many stages throughout the Bay since then including twice at Herbst Theater with Youth Speaks, at Glide Memorial Church, at Life is Living in Defremery Park, at the Tommie Smith Track Tournament, and at the 100 Black Men Gala. The group has also performed extensively at elementary, middle, and independent schools throughout the Bay Area. Chicana Latina Foundation is a non-profit organization which promotes professional and leadership development in Latinas attending college in the Greater Bay Area. CLF is committed to inclusivity and assuring that CLF recipients represent the diversity of the community including those who identify as Chicana, Latina, Indigena, Afro-Latina, LGBTQ, among others. With 40 years of service, CLF has provided scholarships to hundreds of Latina college students and prepared them as the future generations of social justice leaders.